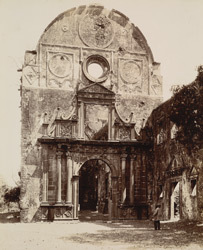 Photograph of the entrance to the Church of the Jesuits, taken by Henry Cousens in 1897-98 for the Archaeological Survey of India Collections. This view shows the ornate façade, with an arched doorway flanked by pairs of fluted Corinthian columns and pedimented window above. In the Progress report for the Archaeological Survey of Western India for the year ending 30th June 1898, Henry Cousens wrote, "A very interesting thing that I discovered there was the presence of Sind tilework in the Church of the Jesuits. It had been used as a dado on either side near the altar end of the church as well as in the gallery. This church was built in 1548 and repaired in subsequent times. The only connection between the Portuguese and Sind appears to have been about the year 1555 when an embassy arrived at Bassein from Mirza Isa, Chief of Tatta, asking the assistance of the Portuguese against Sultan Mahmud with whom he was then at war. This request was complied with and 700 men sailed under Pedro Barreto Rolim. These arrived at Tatta to find they were not required, and, being exasperated by the refusal of the Tatta Governor, Mirzd Isa being away at the front at the time, to pay the expenses of the fleet, the Portuguese, finding the city unprotected and defenseless, fell upon it and sacked it. This then no doubt accounts for the presence of these tiles in the walls of the Church of the Jesuits at Bassein."